I'd be content to spend time there for sure! They'd have to pull me out kicking and screaming! When we left the University of Georgia (way back when), the thing I cried about was leaving the library! They have a library like that in Salt Lake City too!!!! I've been there (a few photos here). It's truly beautiful inside! 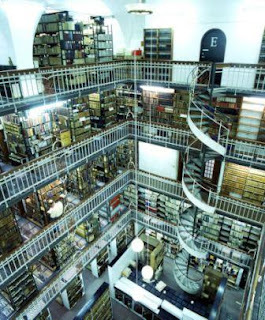 I love looking at different libraries. I really like the Exeter library, by Louis Kahn, as well. There are a few others too. I could go on and on. One of my favorite architectural projects was designing a library!